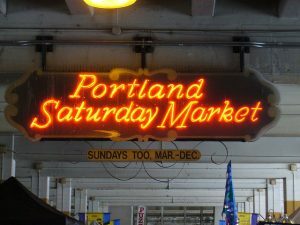 Although Portland is home to “the largest continuously operating open-air arts and crafts market in the country,” the Portland Saturday Market, the surrounding neighborhoods have their own markets as well— some which are just as famous! Join us at these fairs for some fun in the sun. This month alone there are four FREE street fairs so you and your family can enjoy parades, vendors, crafts, and music with no entry fees. Hawthorne Street Fair has vendors, family activities, beer gardens, and live music on the sidewalks of SE Hawthorne Boulevard (from 31st to 41st). Lents Fair has live music, food, craft vendors, a kids’ area, a chicken beauty pageant, and the Belmont Goats in the SW corner of Lents Park. Beaverton Night Market promises a family-friendly event with 55 vendors of ethnic food and crafts, plus performers from around the world at The Round. Fremont Street is closed from 42nd to 50th for Fremont Fest, including a 10 a.m. parade of pets and kids on bikes, music stages, a kids’ zone, and 125 vendors.